Disappointment is a harsh reality we should deal with. 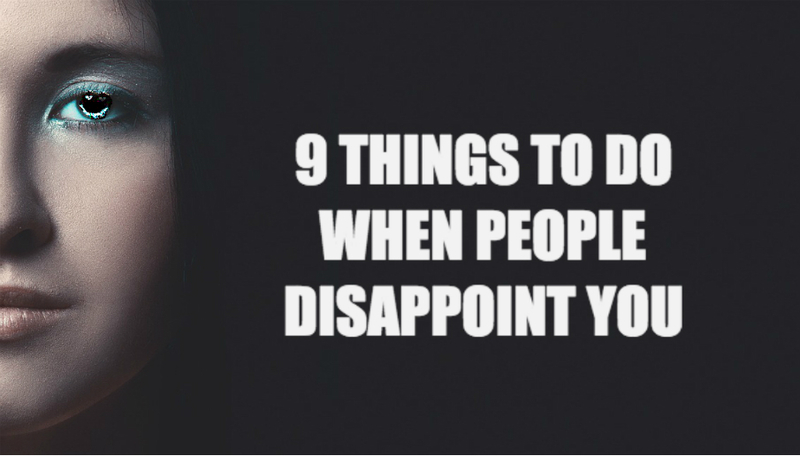 Whether we like it or not, people will disappoint us from time to time. They either turn down our requests or simply act mean. In childhood years, dealing with disappointments may include throwing tantrums, pouting, ignoring people, or devising ways to get even. But such is no longer the case when we’re grown ups because of the expectations we have to live up to. Grown ups are expected not to get affected by somebody’s ill remarks. Yet, we’re humans, and getting hurt is part of the package. What we need to focus on is not to prevent ourselves from getting disappointed but to take care of ourselves when those disappointments come along our way. The next time you’re disappointed, don’t pass the low vibration feeling you get by lashing out at other people, especially your loved ones; instead, follow the tips provided below. There are situations where disappointments force you to put up a false front. For example, when you are passed over for a promotion all the while expecting to be the most qualified candidate, you might feel you don’t have the right to get disappointed. Regardless of whether you have the right or not acknowledging your feelings is important. Of course, you don’t have to tell everybody that you’re disappointed, though that might be expected. Don’t think of what others may feel when they’re in your shoes, just focus on your feelings and how to deal with it. Acknowledge that you’re hurt, that you feel you’re not good enough. After giving a name to your emotions, you’ll steer clear yourself of that feeling. You will then start afresh and able to find the right ways to make yourself more bankable. 2. Recognize your unmet needs. In situations where the disappointment is triggered by a betrayal or being let down, seek for the reasons why that happens. Ask yourself if the disappointment is caused by your needs that are not met. Or, maybe the situation has something to do with your past. You may have felt constantly let down in the past by your family or caregiver. Your need for compassion, understanding, consideration, or sympathy may have been met with physical violence or simply being ignored. Try to untangle the past from the present. By creating a boundary between the past and the present, it’s easier for you to focus on the present disappointment than complicate it with something in your past. And if it has to do more of your past, then it’s time to heal what needs healing and find ways to meet those repressed needs. 3. Take better care of yourself. There’s nothing more disappointing than being forgotten by the people whom you consider important. Let’s say, you’ve arranged for a movie date with a friend who didn’t show up. Upon inquiry, you learned they’re hanging out with their other friends forgetting all about you. It hurts, but you can’t punish yourself because of the way people treat you. Instead of sulking in pain, seek out the company of your other friends, or even your family. Your time is worth to be shared with people who deeply care more about you. Pampering yourself with a soothing bath or taking a walk in nature is also another way of showing yourself loving care. Perhaps, a date with yourself is all you need at the moment. 4. Consider if speaking up is the best option. There are times when speaking up is the best option. This means letting the other person know that you’re absolutely disappointed by their actions or their words; this may be what they need in the first place. But before doing this, you need to weigh the possible consequences should you do this. Ask yourself whether the person is willing to listen to your side of the story, to make amends, or to make an apology. A counterattack may be possible too. Knowing when to pick your battles is a wise decision. Remember, when you decide to speak up, do it in a way that doesn’t foster a heated argument, instead, one that promises a win win situation for you and the other person. Every time you’re disappointed with the people you love, try to consider evaluating your expectations of them. Maybe it’s the month of the year where your partner is the busiest at work, hence they failed to call you. Your friend might be busy with their new baby that they couldn’t provide you time for an outing. Things are always changing. Adjusting your expectations from time to time might be the best way to prevent yourself from getting disappointed. Whether you like it or not, there are people who are good at making people uncomfortable. If you’re disappointed with how your co-worker treats you, set boundaries between yourself and them whenever possible. You don’t have an obligation to be around them when their presence doesn’t empower you. If it’s your partner who’s constantly broken their promises, be clear with your expectations of the relationship. Tell them the things that are beyond tolerable. If they continue doing things that cause you disappointment, it may be time for you to decide whether to hold on or to let go. A person who loves you will try to do things that can make you happy and avoid, as much as possible, to disappoint you. 7. Don’t nurse the pain. At times, people can disappoint you unintentionally. But the pain it causes may seem insurmountable. When they have already asked for your apology and promised not to do the same mistake again, resist the temptation of nursing the pain by focusing on it. Instead, focus more on the good things ahead that you can do together than in the past that you can do nothing about. This way, you can both move on much easier. 8. Avoid rehearsing it in your mind. Rehearsing the offense over and over in your mind can’t help either. You can’t get back at the other person when you keep replaying it mentally. Doing this can only keep the offender imprisoned in your heart. No matter how disappointed you felt for their actions, releasing it is the only way to move on from hurting to healing. 9. Remind yourself of your own imperfections. You should also realize that, at some point in your life, you’ve also caused disappointment to other people, whether intentionally or unintentionally. Knowing your imperfections is the first step to understand the imperfections of other people too. In this fast paced technological age, people tend to lose focus in which they could hurt us without their awareness. Whenever you’re faced with someone’s aggression or simply lack of compassion, be your own best friend. Cheer yourself up. Acknowledge your emotions, do what needs to be done, and pamper yourself. But also, remind yourself that you are a human too. You have flaws and that’s ok. We can all disappoint one another without even intending. Remember, no one has the power to hurt you unless you allow them to.